These special women are so much fun to make. 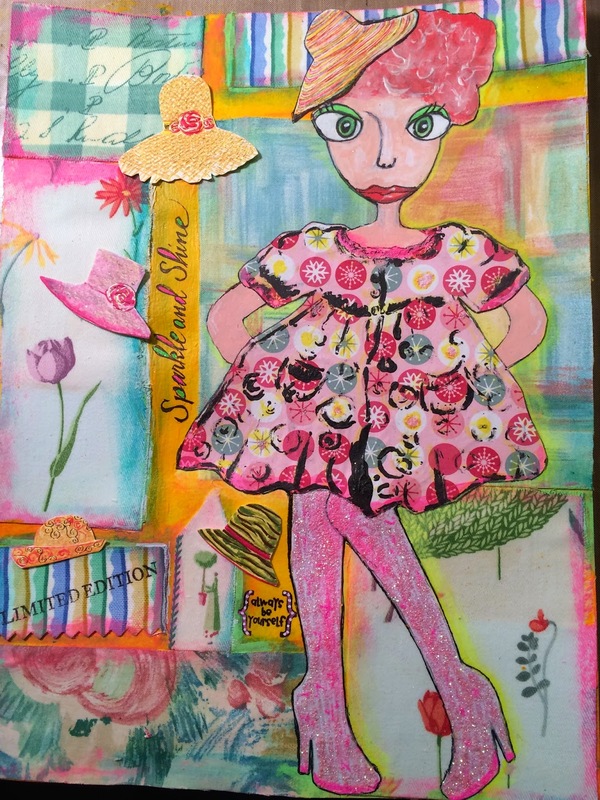 Marieke Blokland has such a colorful influence in her LifeBook 2014 course. As you can see, I REALLY played with colors. I've always thought of myself as a primary color person, but then I find myself falling back on earth tones.....maybe that's a "playing it safe" side of me. I didn't play it safe here and had to reign myself in to keep from overdoing the creation of my Sparkle and Shine Diva. I really wanted her to look all out of proportion. Fabric samples are featured in the background. The hats are recycled from the cover of a thank you note I received. Her sparkly pink boots were traced and restyled from a magazine ad. The little dress is based on a Stencil Girl stencil by Sue Pelletier. I dry embossed the scrapbook paper, then used black gesso to outline the stencil before cutting it out. Her head, eyes and hair are products of my imagination with the influence of Marieke! Sooooo, Ms Sparkle and Shine Diva is born. She has sisters waiting in the wings.